Last night was the Gina K. Designs December release party. I was nervous since it was my first as a designer. It was a fast and furious hour of refreshing the forum feed as well as posting cards and comments. At one point I looked over at my Sonic Diet Coke and thought, "Not now, I can't do one more thing right now". That's intense!! I want to show you the stamp sets that were released and of course they are ready for purchase now. The first is called Hippo Bird Day and the second one is Twine Time. I'll be sharing all the cards I've made with these sets soon. And I have one for you today. You can see it is made with the Hippo Bird Day set. It took some creative clipping to make the layered cake, but it was worth it. I love how it turned out! 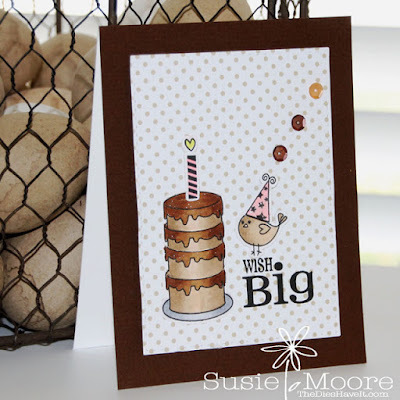 I used my Silhouette Cameo to cut out everything and layered it on my card front with my stamped sentiment. All of the coloring is done with Copic markers with some clear Wink of Stella on top. I used some sequins for thought bubbles since my little birdie is making his wish. Have a super fantastic day and I'll see you again tomorrow! Such wonderful cards, those shakers are amazing!! Love the colors you used also. Thanks for sharing your creativity. Love your shaker cards. they are adorable. Really like the shaker cards. I think most anybody would appreciate receiving one.